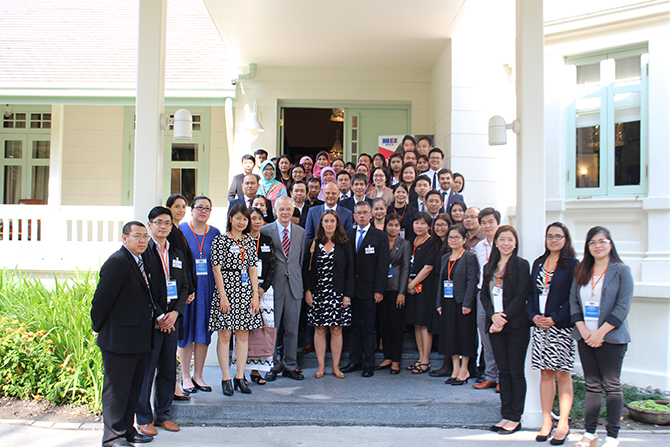 Bangkok, 23 February 2017 - the Third SHARE Scholarship Programme - International Relations Offices Workshop on “Managing Internationalisation and the SHARE Scholarship Programme” was held in Bangkok from 22-23 February 2017 to support the International Relations Offices (IROs) of ASEAN universities participating in the SHARE Programme. The workshop was attended by 32 IROs representatives from the region, SHARE Awardees who are currently studying in Bangkok, officials from the Office of the Higher Education Commission Thailand (OHEC), representatives of the ASEAN University Network (AUN), SEAMEO - RIHED, and the ASEAN Secretariat. The workshop was officiated by Ms. Luisa Ragher, Chargée d'Affaires a.i., Delegation of the European Union to Thailand and Mr. Paul Menkveld, Chargé d’Affaires a.i, Embassy of the Kingdom of the Netherlands, Bangkok. Mr. Remy Rohadian, Senior Officer for Education, Youth and Sports Division from the ASEAN Secretariat also briefed the workshop on the ASEAN vision for International cooperation on Higher Education. The participants discussed key issues on the SHARE mobility framework as well as components of the mobility tools, including monitoring and evaluating the implementation of Batch 1 and Batch 2 of the SHARE Scholarship Programme. The workshop also hold a special session for the current SHARE awardees in Bangkok to share their experiences so far in programme. The participants took note of the lessons learned and in particular, how to build successful cooperation with and between international relations offices. Organised by EP-Nuffic, the workshop aims to support participating universities of the SHARE Scholarship Programme in their process of internationalisation and in particular, to prepare the universities and their international relations offices for the implementation of Batch 3 of the SHARE Scholarship, which is planned to open its application for both intra-ASEAN and ASEAN - EU mobility in March 2017. 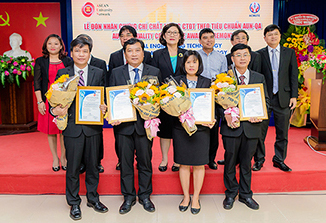 SHARE is a €10 million EU grant funded programme with a principal objective of strengthening regional cooperation, enhancing the quality, competitiveness and internationalisation of ASEAN higher education institutions and students, and contributing to an ASEAN Community. From 2016 onwards, it will be providing some 500 scholarships for ASEAN university students to put the improved systems to the test, mainly by supporting student exchange and credit recognition within the ASEAN region. ASEAN is working with a consortium led by British Council and comprising the DAAD, EP-Nuffic, Campus France, ENQA and EUA between 2015 and 2018 to implement SHARE.